One of the first things I did when I developed the concept of the Chesapeake, Wheeling and Erie Railroad was to establish a numbering system for the freight car fleet. Hopper cars would be in the 70,000 range, with earlier cars in the lower portion and more recent cars in the higher portion of the series. 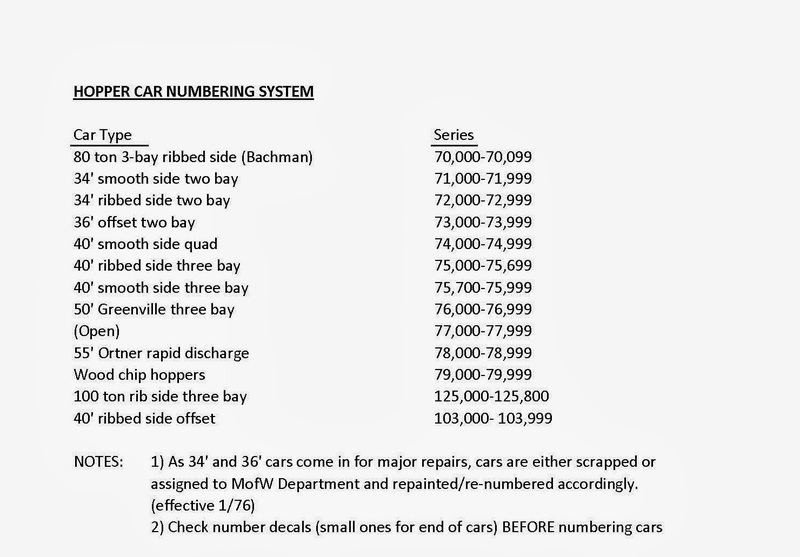 The chart below shows how various cars fit into the scheme. Note the addition of cars in the 125,000 and 103,000 series. Once the Bowser 100 ton cars and the BLI H2A cars became available, I had to add expand the series to accommodated these cars. A quick check of the numbering series for the C&O's vast hopper car fleet revealed that cars were numbered in a variety of series. So adding the 103,000 and 125,000 series certainly seemed plausible. As part of my renewed focus on building hopper cars for the layout, I took a tally of how many had been completed. There were just under 100 cars that had been painted and lettered for the home road. It occurred to me that I could memorialize a milestone by numbering the 100th car as XX100. And while I was at it, I may as well number the 99th car. So below are numbers 125100 and 125099 at Hollister Yard in North Pierce, WV. In the picture below, 125100 is rolling east on the Sand Fork Shifter headed for one of the tipples along the Sand Fork Branch. And in this last shot, we catch 125099 crossing White Oak Creek Trestle, having been loaded earlier in the day at Consolidated Coal Tipple #4 at the end of the Sand Fork Branch. Over the weekend, reports surfaced of an unattended campfire somewhere along the Forest Park Southern right-of-way. Various sources claimed to have spotted smoke somewhere in the vicinity of Beagle Creek while others reportedly saw flames in the distance somewhere around Spook Mountain. Repeated attempts by railroad management to locate the fire were unsuccessful, which wasn't surprising to local residents. "Them people couldn't find the dang fire if they was sitting in it" said a resident of Beagle Creek. The Forest Service and local law enforcement officials have been called in to assist in the search. The authorities are confident the unattended fire will be found soon. As one member of Sheriff's Department said, "Where there's fire, there's usually smoke, and smoke isn't too difficult to spot, even on a cloudy day." After what seems to be like forever, the last two F-units are finally in the paint shop. The photo below shows them ready to receive their first coat of paint. This is one of those projects that just seemed to take forever! It began over ten years ago with the thought that I would take a couple of old Athearn Blue Box shells and upgrade them with American Model Builders windows and a lot of detail parts. One unit was going to be powered and one would be a dummy. Along the way I acquired a Proto Power West can motor and installed it into the Athearn chassis. I even went so far as to add new trucks and side frames and installed a decoder to make sure it would run OK.
Fast forward a few years and I decided to upgrade the units with Highliner shells. When the boxes arrived, I was amazed at all of the parts and the options. It was clear that, in addition to the time required to build the models, I was going to have to do some research and decide which variation of F-unit the railroad would have in service. At one point, I pulled out a couple of Stewart F3's with Kato drives that my Stepfather had given me a number of years ago. I remembered his comments about how well they ran, and it occurred to me that I might be able to use the drives under the Highliner shells. Alas, there didn't appear to be a way to make this work. So it was back to detailing the shells. I started with the rear of the shells and worked my way up to the top before losing interest in the project. It was off to work on other projects. Sometime around 2006 or so, I came across a post on a forum somewhere that talked about how the Highliner shell was a perfect fit for the Stewart chassis. I believe it may have referenced an article on how to make this work. That did it. I went to my file card holder where I've made notes on the articles of interest that I've come across over the years and pulled every article on F-units. There were several that covered the installation of an Highliner shell on the Stewart chassis. By this time, however, I had mounted the couplers to the shells of the F-units. In order to see how they would fit on the chassis, I had to remove the ends of the chassis. This meant disassembling the entire chassis, cutting off the ends with a hacksaw, and then re-assembling everything. After all the changes were made, the Highliner shell fit just as advertised. Perfect! Now I was off to the races. Until I went to put one of the motors back in and broke both of the drive shafts. A quick search of the Internet for parts turned up nothing. A check of the Bowser website showed what appeared to be the correct parts, so I ordered them. Of course, once they arrived, I realized they weren't the correct parts. So the project went back into storage. Some time later, I came across an article about re-powering a locomotive in which the author used brass tubing to connect the two ends of the driveshafts. Bingo! There was the solution to the problem with the F-units. I pulled the kits out, figured out what size of plastic tube I would need, and began working on the project in earnest again. At this point I was adding sound units to the layout, and I decided that both of these engines would get Tsunami decoders. I completely stripped the chassis, disassembled the trucks, cleaned everything, cut out an area for the speakers and the cab interior, and then carefully reassembled the chassis. The truck side frames even made it through the paint shop. The photo below shows the completed chassis at this point. Now that the chassis were almost complete, I turned my attention back to the shells. I wanted to add grab irons to the engineer's side of the cab so I carefully marked the locations on the first unit and drilled the holes. I then proceeded to drill holes for the NBW castings above the grab irons. Every third or fourth try, I would miss where I intended the hole to be and would have to fill the errant hole with Bondo auto body filler. Once the filler was dry, I would sand it smooth and start a new hole. As I neared the top of the shell, I really missed. I filled the hole, but every time I tried to drill a new one, the drill would walk into the old hole. Completely frustrated, I put the project aside again. However, the two shells remained on the shelf above my work area and the chassis were in a box next to them. About the time I put the F units aside, I started operating the layout. It quickly became clear that I was going to need a lot more motive power, and it was clear that a lot still remained to be done on the F-unit shells. So the quickest solution to the problem was to build other units. 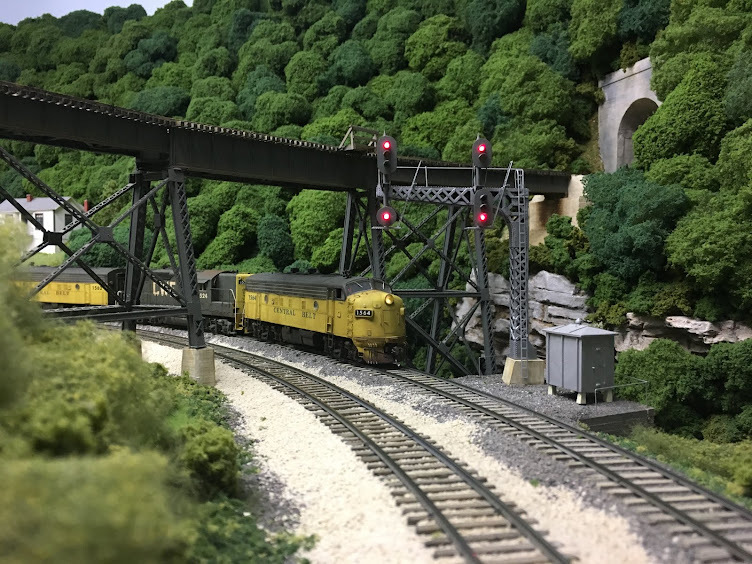 In short order, two U30B's, a Broadway Limited F unit, and two Kato SD40's were painted and lettered, weathered, and placed into service. Then came the construction of the west end staging yard and the changes to the scenery and track around North Pierce. Still later came 18 Detroit Edison unit train cars, two more SD40-2's, and a couple of GP38's. Toward the end of last month, I decided it was time to finish all of the projects that were in various stages of completion. This included the F units. I made one more attempt at drilling the hole for the NBW casting that had stymied me before- with the same result. It then occurred to me that I could shave the stem off the NBW casting and simply glue it to the shell. Success! I was finally able to move on with the project. Prior to digging back into this project, I had come up with idea of creating a small dimple with a pin where I wanted to drill the holes for the NBW castings. The small drill bits have a tendency to walk away from the initial starting point without a pilot hole, and this seemed like the solution. And I also started using a magnifier, which has made all of the difference in the world. Rather than trying to fight to see the location on the shell and denying that I was having any problem seeing it, I finally gave in to the magnifier. Now I wish I had done it years ago. So at last the F units are finally in the paint shop. I still have to paint some figures and determine how I'm going to mount them in the shell. And I have to paint and weather the units. But the finish line is in sight now, and that has provided a lot of motivation to finally finish this project.